Following an action packed show from the Staples Center on April 12, what's next for WWE? After the latest episode of RAW gave us some thoroughly entertaining Television, what do WWE need to address in order to continue in the right direction? It's fair to say that last nights RAW from The Staples Centre in Los Angeles was pretty well received all round. We had top notch Wrestling matches in the form of Cesaro vs Kevin Owens, Charlotte vs Natalya for the WWE Women's Championship and Sami Zayn vs AJ Styles. WWE also started a Tag Team Tournament in order to crown legitimate number one contenders for The New Day's Championships.Overall the show felt more structured and had a better flow than it usually did. All in all it was a good night for both WWE and the fans, but there are still some things that could be addressed, so where should we start? It's probably fair to say that WWE's masked Luchador has had a pretty uninspiring run with the United States Title ever since first gaining it from Alberto Del Rio on the January 11th episode of RAW. He lost it a day later to Del Rio and then regained it at the Royal Rumble. To put things in perspective, this time last year, John Cena and Daniel Bryan were United States and Intercontinental Champions respectively. It looked like WWE were going to try and add some prestige to those championships. Fast forward a year and Kalisto is simply holding the title while part of a Tag Team and the Intercontinental title is more like a hot potato at this point. Sure, Cesaro looks likely to win the Intercontinental title and go on a good run at Payback but what about the US Title. WWE need to either break up The Lucha Dragons or have Kalisto lose the title to someone else. Baron Corbin would be someone who would benefit from a run with the title. Especially after beating a "little guy" like Kalisto. Last night we finally saw the highly anticipated debut of former Bullet Club members Luke (formerly Doc) Gallows and Karl Anderson. For those of you who may not know who Bullet Club or either of these two men are, I would advise you got and check it out. Bullet Club is one of the most popular factions, not only in New Japan Pro Wrestling, where they ply their trade, but also in the entire world. The rumours started swirling at the start of 2016 when they handed in their notice to NJPW, along with AJ Styles and Shinsuke Nakamura, both of whom are also now in WWE. 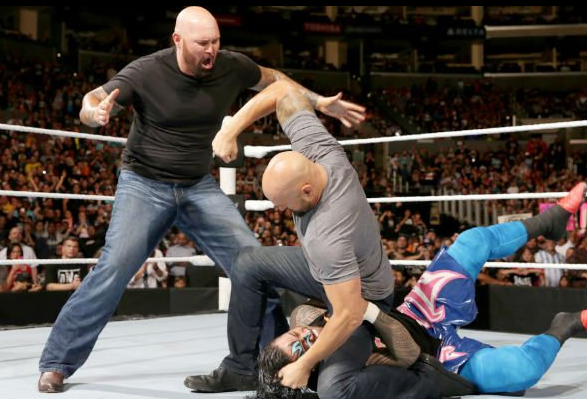 Gallows and Anderson made a pretty big impact on their debut, jumping the barricade and beating down the babyface team of The Usos. It will be interesting to see where they go from here and there are many questions. Will they continue to have a problem with The Usos? Will they turn their attentions straight to another team? Will Finn Balor arrive on the scene to lead his former Bullet Club brothers? Will they turn to another former Bullet Club leader in AJ Styles for help? We just don't know and that is great. Intrigue and mystery creates great Television. Don't get me wrong, I prefer having Shane McMahon run RAW just as much as anybody else, but The Authority aren't exactly just going to vanish into thin air are they? It wouldn't make any sense if they simply laid down and accepted Roman Reigns beating HHH at WrestleMania. Combine that with the fact that Shane McMahon is now running RAW, their show, and they are probably pretty angry right now. Eventually they'll be back. It may be next week, it may be next month, but they will be back eventually. The problem is they need to be given something meaningful to do while also being entertaining. The Authority vs Roman Reigns never really got off the ground so hopefully WWE won't try that one again. Perhaps Triple H and Stephanie will take issue with Shane McMahon? Could we see a turf war arise? Maybe an Authority backed Bullet Club vs a Shane McMahon backed Shield reunion at Battleground could solve some problems? Last week for my first article I talked about where the women in WWE could go from here. Unfortunately the latest edition of RAW didn't really give us much to go on. Charlotte retained the Women's Title after interference from Ric Flair AGAIN which is starting to get borderline ridiculous. Apart from the Women's Title match however there was no hint of any other Women on RAW. Becky Lynch and Emma have a problem right now but that wasn't addressed. Sasha Banks, arguably one of the most popular people on the entire roster, wasn't even mentioned. Even people like Paige and Naomi weren't on the show. WWE's roster is starting to get packed right now which is great but even just a backstage segment would've been nice. If WWE can address these things on next week's RAW or even on SmackDown! then a lot of questions will be answered and WWE will continue to go in the right direction. Cesaro must spend a fortune on Suits. Curtis Axel's cosplay of John Cena is fantastic. Karl Anderson and Luke Gallows beard game is on point. AJ Styles incredible near fall in his match vs Zayn may be challenging Undertaker for closest near fall of all time. With Seth Rollins still injured, Dean Ambrose is the closest thing to the complete package in WWE right now. Bray Wyatt has an awesome Hot Tag. Wyatt was getting more cheers than Roman Reigns. Interesting one that. What can WWE do to improve Monday Night RAW going forward? Can they continue their run of good form coming out of Wrestlemania?